Kanchanaburi, or “kanch” for short, is a 2-hour drive from Bangkok. We took the wrong bus to Kanch, leaving us stranded in a small town in the middle of the night. Luckily, we found a local university – and they understood minimal English, or interpreted our minimal Thai. Minimal, as I’ve learned, is all you need to get by. We boarded a van that took us directly to where we needed to be. In retrospect, this taught me how to travel – getting lost (for the 2nd time in Thailand). 🙂 We stayed at a backpacker hostel – the Jolly Frog at $6.00 CDN/night for a fan room with a private bathroom! The room had a patio area that overlook the grounds and the River Kwai. Clean and basic, it’s a place I’d recommend for those on a shoestring budget. After a night of exploring the nightlife (buckets of alcohol for $10), we went on a tour! 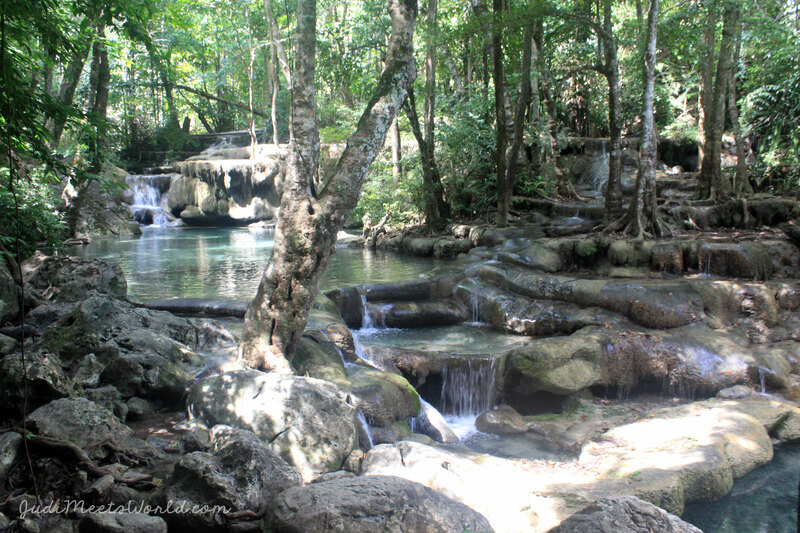 Our first stop was to do a self-guided waterfall hike/trek to Erawan Falls at Erawan National Park. We went all the way up, and enjoyed the views and water. The water, I’ll add, naturally contains doctor fish who eat dead skin cells off your body – quite a surprise, and a fun experience, if I do say so myself. There is a lot of military history in Kanchanaburi, which was home to many POWs in WWII, who helped to build the bridge over River Kwai. Many lost their lives, giving it the second name of the Death Railway. You can still take a walk on the railway and also go onto one of the trains itself, still making the passage over rickety rails. There’s something surreal being on that track, knowing how many lives were lost in its construction. We ended the day, appropriately, at the War Cemetery, commemorating the many POWs who lost their lives in Kanchanaburi. Looking for a quick trip while in Bangkok? Check out all the history and natural beauty just 2 hours away. Happy exploring, travelers!